Use In Mexican Recipes. It's Also A Versitile Spice For Everyday Use. 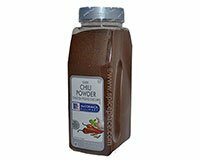 Chili Powders are a blend of seasonings based on cumin so they have a southwestern US flavor and aroma often associated with chili and tacos. 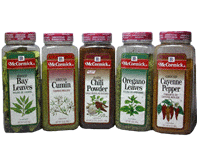 The difference in the various McCormick Chili Powders is the flavor profile. They each offer different tastes. Usage: Use 2 to 3 tbsp of McCormick Dark Chili Powder in 4 cups of Chili Con Carne. Add chili powder to Spanish rice, tomato juice, soup and barbecue sauce. 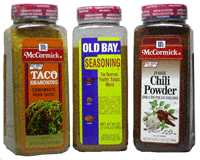 Because of it's southwestern US, Mexican influence, McCormick Choice Chili Powder can be used to flavor Mexican dishes as well. Ingredients: Chili Pepper, Cumin, Oregano, Salt, Silicon Dioxide (added to make free-flowing), and Garlic. Use 2 to 3 tbsp of Dark Chili Powder in 4 cups Chili Con Carne. Add Chili Powder to Spanish Rice, Tomato Juice, and Barbecue Sauce. Use Chili Powder in Mexican Style Dishes. Season Chicken Wings, Hamburgers, Beef and Chicken Stews with Chili Powder to add a delicious southwestern US taste. Toss Chili Powder with shredded Cheddar cheese and melt with tortilla chips to make Nachos. Mix Chili Powder with pinto beans, bean dip, tamale pie and enchiladas. Sprinkle Chili Powder on corn bread.